The Moab Century Tour is a two day cycling event that covers all of the amazing landscape Moab has to offer! From gaining elevation into the La Sal Mountains (including "The Big Nasty! "), to carving down through our red rock canyons, and finishing along the mighty Colorado River, this event has landscape worth training for! Cycling Teams and individual groups use the event to inspire their fundraising for large and small foundations making a difference in cancer treatments and survivorship beyond. Join us in September when temperatures cool down, the fall foliage comes alive, and cyclists from across the country unite in red rock country to experience awe-inspiring landscapes. 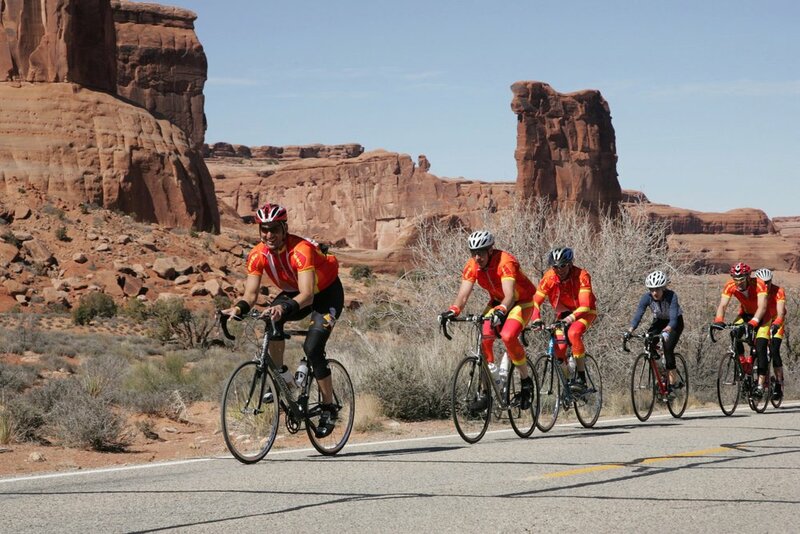 The Century Tour will showcase to riders Moab's full geographical beauty. Saturday we offer three unique rides to fit all skill levels and endurance needs. All 3 rides will offer breathtaking views of Moab's sandstone marvels and majestic Colorado River. Sunday we travel as a group on the La Sal Loop road up into, and around, our La Sal Mountain Range. For all the rides there is SAG vehicle support and Aid Stations equipped with water, real food, cheery volunteers to assist you, and event communication volunteers who help keep all of us communicating! This out and back route travels Highway 279 and is a favorite among local roadies because of its unbroken cadence. After passing through the rocky outcropping called "The Portal," the Colorado River begins its cut through the impressive sandstone. The road meanders alongside the tranquil river, maintaining a flat profile through some of the most astounding topography imaginable. Red rock walls rise hundreds of feet straight up from the shoulder of the road as it cuts tightly along the river. Pull over at "Wall Street" and enjoy a drink of water as you spot climbers plying the walls next to 1,000-year-old Anasazi petroglyphs carved in the ancient rock wall. Enjoy the bike path all the way to Hwy 313 as you ride out of town and past Arches National Park. Once on Hwy 313 you begin the climb from the valley floor to the Mesa top above Moab, all the way to the incredible Dead Horse State Park for a spectacular overview at the Earth's edge viewing the Colorado River two thousand feet below. Enjoy the reward of the descend as you wind back down 313, the freshly paved bike path, and crossing the mighty Colorado River. This route combines the Dead Horse route with the River Portal route for a full day of fun! Start off on the paved bike path north to Highway 313. Follow the route to Dead Horse Point State Park for a spectacular overview at the Earth's edge viewing the Colorado River two thousand feet below. As you descend back to town, turn at Hwy 279 to access the River Portal Route. This combined route will leave you with a sense of accomplishment for a day of life spent well! A route worthy of your cycling resume! Traveling from scenic valley of Moab into the aspen lined foliage of the La Sal Mountains, through red rock spires of Castle Valley and towering sandstone cliffs along the Colorado River, this route with it's beautiful vistas, will feed your soul. Limited to 300 cyclists. Click for More Details on La Sal Mountain Loop Ride & "The Big Nasty"
The La Sal Mountain Loop route offers an incredible collection of cycling pleasures. Foremost, it incorporates all of the iconic landscapes Moab has to offer. Towering red rock canyons flush with the meandering Colorado River, majestic La Sal Mountains, roadways arrowing through vast views of mystical desert. As if this were not enough, there is the challenge of a steep climb to ascend from the valley floor straight up into the mountains within a short 7 mile stretch, nicknamed ‘the Big Nasty’. Certainly, a climb worthy of bragging rights on anyone’s cycling resume, you experience grades rarely seen on roadways. Realizing the expert nature of this climb may not be for everyone, look for our convenient support vehicles when you have had enough and let us help you to the top. Cycling the upper contours of the mountains is not to be missed, so save some energy! Vast mountain views begin to emerge the approaching descent back down to the canyons below. Starting as a winding passage through Aspen groves along the mountain side, the roadway changes into a diving ribbon cutting straight through the lower desert landscape. Here you enjoy the long lasting joy of high speed with an effortless spin of the pedals. As the Colorado River grows near in sight, the anticipation of carving through the energized red rock canyons returns. Once in the canyon along the river, you are treated to an epic spin to the finish! Prefer to pay by check? When checking out, you will be able to choose "pay by check." We appreciate you submitting your payment within 48hrs of registration. Have further questions? Check out our FAQ Page, or give Beth a call or text: 435.260.8889 or send an email. Did You Know? We donate $10 of every Moab Century Tour registration to the Moab Cancer Treatment Center? Learn more about why we ride, here.